Moving to another country can be scary in many ways, but nothing as scary as natural disasters. On March 11th, 2011 a huge earthquake shook the Tohoku region of Japan, leading to a tsunami and leaving widespread destruction in its wake. In 2018, there were 2 big earthquakes, 2 typhoons, and flooding that rampaged through the Western part of Japan (one earthquake in Hokkaido), which lead to the 2018 kanji of the year to be “Disaster”. This was a wakeup call to many, including me, to be prepared for the worst. For the most part, Japan is a safe country to live in in terms of crime rate, but Earthquakes are a part of daily life. But when a big one hits, it’s best to be prepared for the worst. Not just for earthquakes, but for any type of Natural Disaster that can happen in Japan. 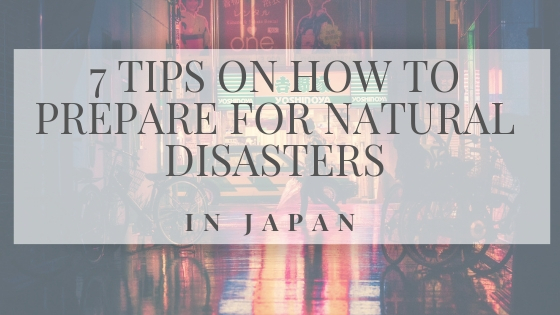 Here are my 7 tips on how to prepare and cope with Natural Disasters in Japan. *DISCLAIMER* These tips are only to be a compilation of information for people in Japan to be prepared for disaster, not a direct source of help. Please contact the respective agencies and resources that I list here for emergencies and direct help. Landslides, Floods, Typhoons, Earthquakes, Volcanic eruptions and Tsunamis are all types of natural disasters that can happen in Japan, depending on the area. Depending on where you live in Japan, there are different types of disasters that occur more often than others. As an example, Okinawa is in the middle of the Pacific Ocean, so it is one of the places in Japan that is the most prone to Typhoons during Typhoon season. If you are near the mountains, landslides/ mudslides could be a problem. Living near the sea you are more prone to Tsunami’s if an earthquake hits. Are you near an active volcano? The answers to these questions can be as simple as asking a local, or asking your local ward office what types of natural disasters occur in the area. From there you can see how to prepare in case one of them does happen in your area. The Japan Metrological Agency website is the most direct source of up to date information out there on Typhoons and Earthquakes and other weather-related information. The website is in English and has a lot of good information on when a typhoon is coming, as well as information on all of the different earthquakes that have occurred. You will be surprised how many earthquakes Japan has in a day. You just don’t feel them! The first thing I do when there has been an earthquake in my area is turn on the TV if I am near one and check where the earthquake had happened and what the damage is so far. For typhoons, most news channels will have constant updates on where the typhoon is and any urgent evacuations or new developments, so its best to keep this on in the background just in case. They even provide train line updates, as the train lines shut down automatically after an earthquake to inspect for any damages. Back in June of 2018 when the earthquake hit the Kansai region, I kept the TV on in my apartment all day to get the most recent information on damage and train lines. After the earthquake in Osaka in June 2018, my roommate and I decided to get serious and to finally gather an earthquake kit. You can buy a pre-made one at a store or you can look up what should be needed and make one yourself! We decided to make one ourselves and it contains basics like bottled water, canned food, first aid kit, etc. Ideally, it contains 3 days of essentials in for the worse case scenario. To build your own kit, check the advice HERE from the US Embassy in Japan. There are also a lot of other helpful disaster tips contained there too! Japan Info Swap also has a helpful article too. For an already prepared earthquake kit, check HERE at Rakuten. Go to your ward office website and check where the evacuation points are, as each ward handles the evacuation points. Most of this information is in English. For example, type in “Chou Ward Osaka” and the website in English should pop up with a link for evacuation points. Its a very good idea to talk about disaster scenarios with your friends before I happens, no matter how “morbid” it sounds. When you’re living by yourself in a foreign country, it can be hard to be together with someone at the time of disaster, but make sure to talk with your friends and have a general plan on how to contact them or where to meet up in the case of a disaster. Safety is better in numbers! Someone will know if something happened to you and its another safety net to make sure you are accounted for during a disaster. Most countries run a program for people living or traveling overseas to register with them in the event something happens to the traveler or a disaster strikes. If you register with them, they know that you are in the country and will come looking for you if there is a disaster in your area. This also gives a point of contact to family members if they cannot get in contact with you for whatever reason. They can contact the embassy and ask them to give updates on your location etc, and its more helpful for the embassy if they already have your information on file. The USA embassy program is called STEP and it can be found HERE. Any tips that I missed? Any other tips or information that you would like to see? Let me know in the comments below!